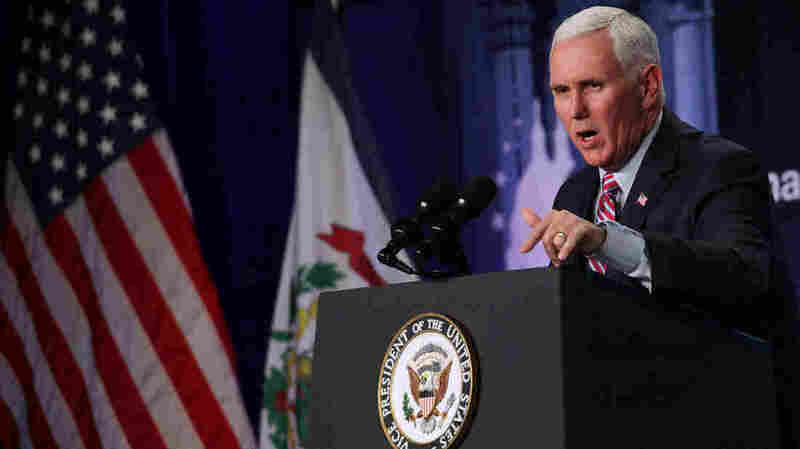 Winter Olympics: Vice President Pence To Keep Pressure On North Korea : The Two-Way As Pence heads to South Korea to represent the U.S. at the Winter Olympics, he plans to counter North Korea's media messaging and push allies to maintain pressure on the nation. Vice President Pence addresses a dinner earlier this year in White Sulphur Springs, W.V. Pence is heading to South Korea for diplomatic efforts and Olympic events. Vice President Pence is heading to South Korea, where — in addition to representing the U.S. at the Olympics — he plans to counter North Korea's media messaging and push allies to maintain pressure on the rogue nation, according to multiple reports. Pence is also visiting Japan on this trip to Asia. As NPR's Elise Hu reports, the VPs aides have said that he wants to use the time in Korea to remind the world that just because North Korea will have a visually appealing cheering squad and an impressive figure skating duo, the regime running the country is brutal and totalitarian. "One obvious sign of that is going to be who Vice President Pence is with," Elise says. He's expected to attend the opening ceremony with the father of deceased American college student Otto Warmbier, who died after being imprisoned in North Korea. That's going to be a public reminder of that secrecy and brutality— at the same time that North Korean dignitaries will be in the same audience. An Axios reporter and a Washington Post columnist both say they spoke to an unnamed White House aide who told them the White House won't allow North Korea to "hijack the messaging of the Olympics." Both outlets report that Pence plans to promote the White House's "maximum pressure" policy on North Korea, encouraging allies to maintain hardline positions, and emphasize North Korea's autocracy and brutality as Pyongyang pursues positive media coverage. North Korea is sending its ceremonial leader, King Yong Nam, to the Pyeongchang Winter Olympics, where he will meet with South Korean President Moon Jae-in. As NPR's Scott Neuman reports, that trip comes "amid somewhat eased tensions between the bitter rivals." The two Koreas are marching under unified flag in the opening ceremonies. Reuters reports that there are growing hopes that inter-Korean talks might be possible during the Games. "I've been likening the North Korean participation in the Olympics as kind of like The Wedding Crashers, where they just storm in, guzzle everybody's champagne, other people's food and then they're going to leave a mess behind. And nothing they've said since Kim Jong Un's New Year's address has suggested that they're going to be talking about their nuclear weapons program at all. In fact, they've not had any pressure from South Korea or anybody in terms of talking about nuclear weapons." Pence's trip, according to reports, will seek to bring more of that pressure back to the international approach to North Korea. As the AP notes, the trip "also provides [Pence] with an eject button as the threat of another big budget battle looms because of a standoff on Capitol Hill over spending and immigration." A previous version of this post misidentified Jung Pak as a man; she is a woman.